Zakiya Adair is an assistant professor in the Women’s Studies Department at the University of Missouri, Columbia. She received a Ph.D. from the University of Washington, Seattle, in 2010. Her undergraduate degree is in African American studies and philosophy from San Jose State University in San Jose, California. 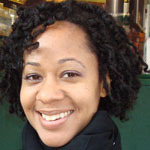 Zakiya, a California native, specializes in twentieth century social and cultural history of women and African Americans. Her dissertation focused on cultural manifestations of race, gender and class in the transnational performances of African American women entertainers in Paris, France, London, England, and Harlem, New York between World War I and World War II.